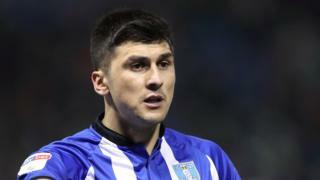 An arrest warrant has been issued for Sheffield Wednesday's Fernando Forestieri after he failed to attend court. The 28-year-old striker was due to appear at Mansfield Magistrates' Court earlier. He has been charged with using threatening words and behaviour, and racially aggravated harassment on 24 July, the court said. However, Forestieri failed to attend and a warrant without bail was issued. The offences allegedly took place after a match with Mansfield Town.